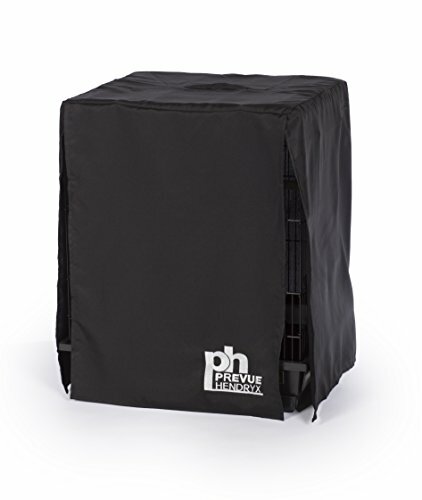 The Prevue Hendryx Medium Bird Cage Cover scored high marks in all areas and is our top pick. The machine washable cover is colorfast so it won’t fade. It is made of 100% non-toxic material that provides plenty of air circulation even when the cage is completely covered. The dark fabric keeps out light so the bird can get into a sleeping pattern and also provides a feeling of safety for nervous birds. A bird cage cover is more important than many bird owners may realize. They are very useful for encouraging the bird to get plenty of sleep. They are also important to the bird’s overall health. Other benefits include giving the bird security and peace of mind, protecting them from drafts, and containing messes they cause by throwing seed hulls. They are not mandatory accessories but if you want your bird to be as healthy as possible, it is a good idea to purchase one of these bird cage covers. There are several different styles of cage covers on the market. To choose the best one for your bird there are some things you will want to take into consideration. These factors will make choosing the right bird cage cover much easier. We spent over 20 hours researching and testing 10 different kinds of bird cage covers and found that the privacy it provides, breathability, and size options were most important. The purpose of the following reviews and the buyer’s guide is to provide the right information for you to use when you are researching the different bird cage covers. This information will make the decision making process much simpler. Prevue brings another quality cage cover in this medium cage cover that fits cages 20” x 20” x 29”. You won’t have to worry about any toxic materials. 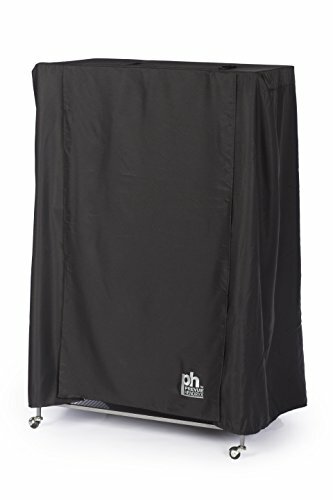 This cage cover is made from 100% non-toxic materials that are machine washable and colorfast. The black fabric works well to establish set sleeping schedules for your bird no matter what time of day or night it is. This cover blocks out the distractions and light without eliminating circulation that can overheat the bird. The logo on the bottom right is the only design on the black fabric which makes this cover work with most color schemes in your home. Prevue Hendryx is one of the leading providers in Universal bird cage covers. This cover can be used for any type of bird without danger regardless of whether the bird cage in on a separate stand or on a counter. Bird cages can come in all shapes and sizes. This extra wide bird cage cover works for bird cages that measure 41” w x 21” d X 44” h.
The cage cover is specifically designed to work with extra-wide cages. There is a handle on top of the cover for easy removal when it’s time for your bird to “wake up”. The color and material of this bird cage cover creates a dark, peaceful atmosphere that will help your bird establish good, healthy sleep schedules regardless of when you want your bird to sleep. The material is breathable to allow air circulation and is 100% non-toxic and bird safe. Birds need about 12 hours of sleep to be at their healthiest. This cover will help your bird get the sleep they need to be happy, healthy bird. This Universal cage cover can fit bird cages that measure 41” x 27” x 48”. This cage cover is made of lightweight, 100% non-toxic material that is breathable and lets circulation through even when covered. This cover is machine washable and colorfast so it won’t fade. The lack fabric provides plenty of coverage while not completely blocking out air flow. Regardless of what time of day you want your bird to sleep, this bird cage cover will enable you to accomplish set sleep schedules. Use this bird cage cover to help your bird sleep better and to reduce the distractions that can upset nervous birds. There is a Prevue logo on the bottom corner of the cage cover. Using this cover will provide you with an easy to use, simple way to help your bird establish regular sleep patterns. Many people may think that you only cover a bird’s cage when you want them to be quiet, but this is not the most important reason to get into this habit. Birds need a lot of sleep each day, as much as 12 hours a day. It can be difficult for them to get this amount of sleep especially if the cage is in a high traffic area of the home such as the kitchen or living room. When a bird is suffering from sleep deprivation they can start exhibiting problem behaviors such as biting to let their owners know they are tired, cranky and unhappy. This sleep deprivation problem is easily solved with the purchase of a quality bird cage cover. The right bird cage cover will provide protection from noise, light and disturbances that can rob them of important sleep. When looking for a bird cage cover, there are a few things you will want to take into consideration. These factors will help you purchase the cage cover that is just right for your bird’s cage. To learn more about choosing the right bird cage cover, read the buyer’s guide below. It is designed to provide bird owners with the information they need to sort through the different covers, look at all the options and make a decision that will work the best for their bird’s needs. There are many benefits that a bird can gain from being covered with a quality bird cage cover on a daily basis. We have listed the more common benefits below. Blocks Drafts – Drafts can be very dangerous for a bird, especially more fragile species like canaries that require warmer temperatures. Using a quality bird cage cover will prevent those potentially dangerous drafts from becoming a problem. Make sure your bird cage is not placed in a drafty place so there is not constantly fluctuating temperatures when the cover is used. Your bird will be much healthier for doing this. Covering your bird’s cage at night when the temperatures drop will help keep your bird on a regular schedule and will keep them much healthier and calmer birds. Blocks Noise – Birds can be really excitable. A good quality bird cage cover can block daylight and light from lamps as well as some of the noise that goes on in your home. Blocking this noise can help them relax and get the sleep they need to be as healthy and happy as possible. If you have your bird in a super high traffic area, you may want to consider moving them to a lesser traveled area. You don’t want to isolate them but constant noise and traffic can be very upsetting. Helps Establish Sleep Schedules – One of the biggest benefits to using a bird cage cover is helping you to get your bird set up on a regular sleep schedule. With sleep being so important to your bird, it benefits you and the bird by setting them up on a regular schedule. Having a good bird cage cover also helps keep the bird quiet so it does not disturb the owner at inappropriate times with squawking and cage rattling. All you need to do is cover the bird at the time you want him/her to sleep. Leave the cover on the cage and the bird undisturbed for an extended period of time. When you want the bird to wake up, pull the cover off. Do this every day at the same time to establish regular sleeping and waking times. It is not cruel to cover your bird’s cage with a cover. It is the same as using a white noise machine or covering the window with something to block out the light so your child doesn’t wake up too soon. Using a bird cage cover gives your bird some structure and helps reduce excessive noise from the bird at inopportune time and can also help them be as healthy as possible by providing them with set awake and sleep periods. Helps Regulate Temperature – Bird cage covers are used to regulate the temperature within the bird’s cage. While it is not easy to raise the temperature inside the cage just by covering it, it can prevent drafts and will maintain a stable temperature. Thicker bird cage covers provide more protection from drafts than thinner, flimsy ones. When Not to Use Bird Cage Covers – If you bird gets upset when the cage is covered it is better to not use it than have a constantly stressed out bird. Your bird’s cage should be their safe place where they can be happy and secure even when the cage is covered. Don’t punish the bird by covering them at odd times. This can confuse them and cause them to get off their sleep routine. If the bird is being unusually noisy during their awake time, spend time with them and make sure that they have plenty of food, water, treats and toys to entertain themselves. Birds can be social creatures and they need attention as well and will act out when they are neglected. Get Them Used to it Gradually – It is very normal for your bird to pick at the new bird cage cover when you first start using it. Even if they are used to it they may pick at it. Once you have a set sleeping pattern established, if you notice them picking at the cover it could indicate that the cover has been on the cage for too long and they want to wake up. Make sure that you bring the bird’s cage cover with you wherever you take the bird and his/her cage. This keeps things stable and consistent for your bird. If your bird has never been covered, take the time to get them used to it gradually. Do this by covering them for short periods of time at first and extending the amount of time they are covered each week until they are at the desired sleeping time. 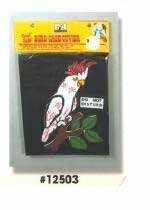 The Bird Cage Cover Material – Because your bird will pick at the cover, it is very important that you only use an approved, non-toxic bird cage cover like the top rated covers we have featured above. This ensures that the birds will not be harmed by anything in the material that could be toxic. The best way to ensure the most safety for your bird is to only use bird cage covers that are commercially sold rather than using a sheet or blanket. If your bird cage cover is machine washable, look at the manufacturer’s directions for washing and the use of bleaches, detergents, etc. When they are used correctly, a bird cage cover can help you create a very secure and peaceful sleeping environment for your bird. The best covers to purchase are the ones that have been specifically designed as bird cage covers and have been made from non-toxic materials that will not harm the bird. You also want to make sure that the material is durable, tightly woven so the bird doesn’t get their beak or claw caught and heavy enough to block noise and light but not so heavy it blocks airflow. All birds are different and what may work for one won’t work for another. If you are new to using a bird cage cover, take your time getting the bird used to it and be patient. Taking the time to establish a good sleep schedule will ultimately result in a very happy, healthy bird and happy owner as well.